From English and Irish ancestry, Alex Dearden was born in Calcutta, India in 1940. He was a publicist, explorer and photographer, getting to know Venezuela in his trips. He loved sailing, acting, gourmet kitchen and his three children: Daniella, Alexis Mario and Conor Gustavo. 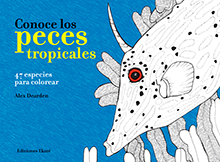 The book Conoce nuestros peces is an effort in the spreading of the Venezuelan marine fauna for children.